I have weird skin and lots of skin issues. I’ve tried a lot of different products out there, with sometimes ok and sometimes horrible experiences. I used Mary Kay products for years and liked a lot of them. My friend Star used to sell it, so that was a nice perk! But she doesn’t sell it anymore and I don’t really want to make the effort to find someone else. So my skin is usually pretty dry and red and sore in the wintertime. I also have acne, and take a medication for acne because I get cyst acne (very painful). The other skin issues I have: I have eczema sometimes and psoriasis. So that can make issues worse and certain lotions and creams, etc, can irritate it. Thankfully I have both conditions managed about 90% most of the time. I just have to be careful. I’ve tried everything out there from Oil of Olay to Neutragena to Noxema, to Aveeno, to Ponds, to Proactiv, etc etc. Nothing ever really worked. It was either too greasy, too oily, made me break out worse or dried me out. For Christmas, my friend Star got me some beauty products and so far I really like them! And bonus: they are made locally in Portland. She got me the Pacifica Quinoa Sensitive face wash and the Pacifica Dreamy Youth moisturizer. I really love it so far. The moisturizer especially feels nice, creamy on my face and good for my skin. I absolutely LOVE Trader Joe’s Coconut Body Butter. I use this a lot in the winter time especially and I use it every time after I go swimming. Swimming really dries out my dry skin even worse than normal and this stuff is amazing. It works so well and moisturizes my skin all day. It doesn’t wear off like everything else I’ve tried. It also smells great. So if you are a swimmer, I highly recommend this! Seriously amazing! It’s like magic! It healed the dry, cracked feet almost overnight. I love this stuff! A friend on Facebook recently raved about rosehip oil for a long list of skin issues. I decided to give it a try. I am not quite sure yet what I think about it. It feels really nice on my skin and so far it seems to be working well as a moisturizer (and for my psoriasis), but it ironically doesn’t smell very good. I was expecting it to smell like roses but it doesn’t. I’ve never seen the appeal of facials because I have such difficult, sensitive skin. I didn’t want to go and pay a lot of money for something that was just going to make me break out. I had a day off recently and saw Dan for the facial. I told him I had super sensitive skin and we talked about my skin issues and I told him how sensitive I can be. He did a fabulous job! I would love to go back and get another one with him. He was super nice and friendly and chatty and very informative. No redness! And my skin felt so awesome afterwards. I wish I could remember every thing he did…he cleansed, used toner, did a facial/neck/shoulder massage with almond oil, did a few different masques and put several hydrating lotions on my skin. He did not recommend any kind of peel or Microderm abrasion type procedure because my skin is so sensitive. I’d like to go back in the future and do it again. Are there any skin products that you absolutely swear by? Let me know! Saturday morning I woke up about 7:30am. I got a good solid 6 hours of sleep and apparently that’s all I needed! Anna was still asleep so I got dressed and went down to the gym. The Bally’s gym was SO NICE! 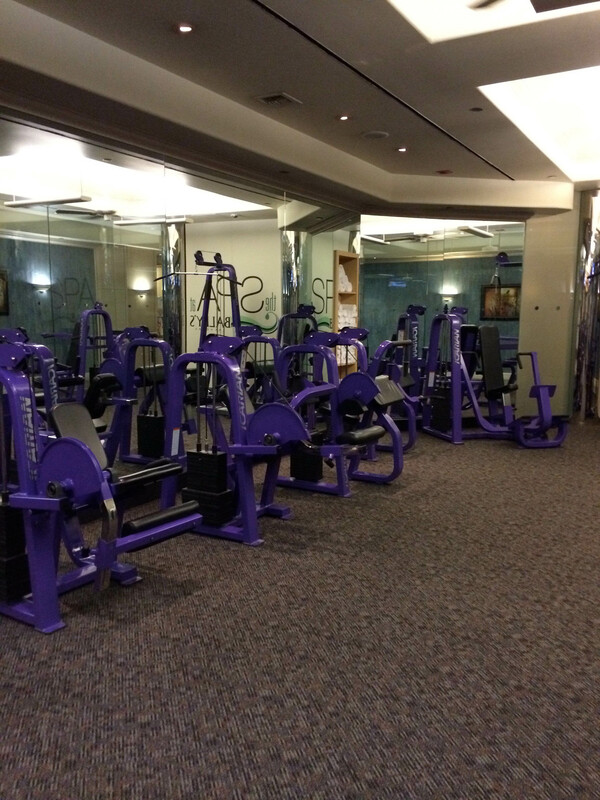 One of the best hotel gyms I’ve used (The Monte Carlo being my other favorite). They had half a dozen treadmills, about 7 ellipticals, some stair-masters, exercise bikes and TONS of weight machines and free weights. I was one of three people in the gym that early. My friend Debby and the people she went to Vegas with were on their way to Red Rock Canyon for a hike (which sounded awesome to me). I warmed up on the elliptical, did some body weight exercises (burpees, jumping jacks, crunches, etc) went through the weight machines, did some free weight stuff and finished up with a half mile run on the treadmill. My legs were tired from all the walking we did on Friday. 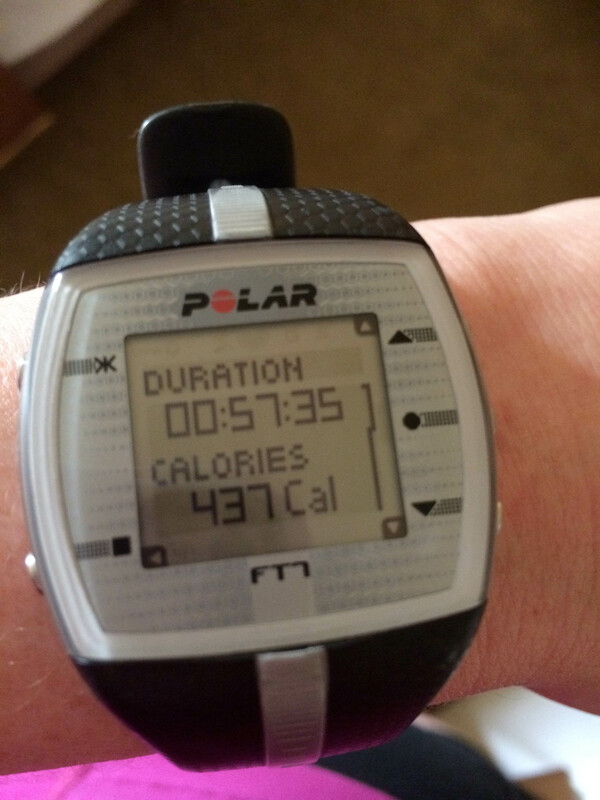 I knew I should take it easy with the lower body cardio because we were going to do even more walking on Saturday. 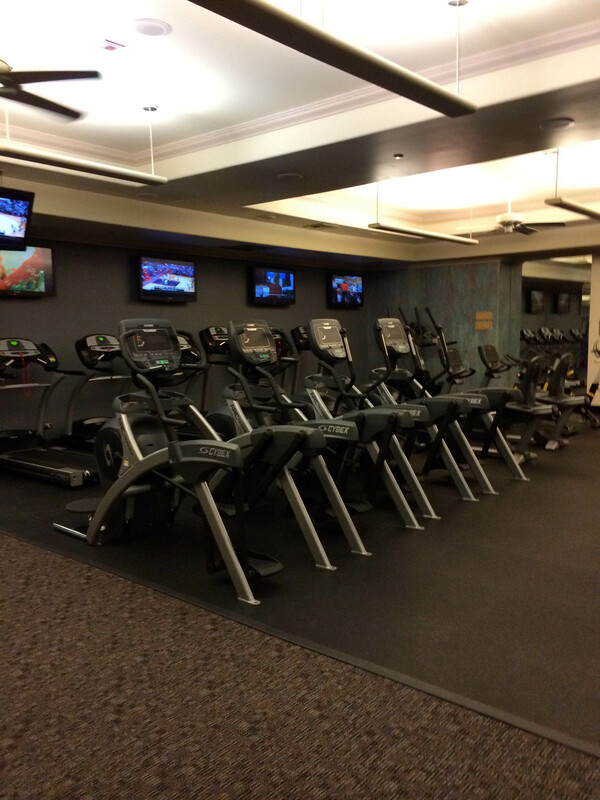 I got a fantastic workout in, burned some calories and then checked out the spa that guests could use. They had a body temperature hot tub, a hot hot tub, a dry sauna, a steam room with eucalyptus and then your typical spa services. The men’s and women’s spas were separate and there were a bunch of ladies in there waiting for massages. I told Anna that we should make good use of it (especially since we were paying $20 per night for the “resort fee” to use it) but sadly we ran out of time and didn’t get to it. I got cleaned up and then Anna and I went out in search of breakfast. I was staving! 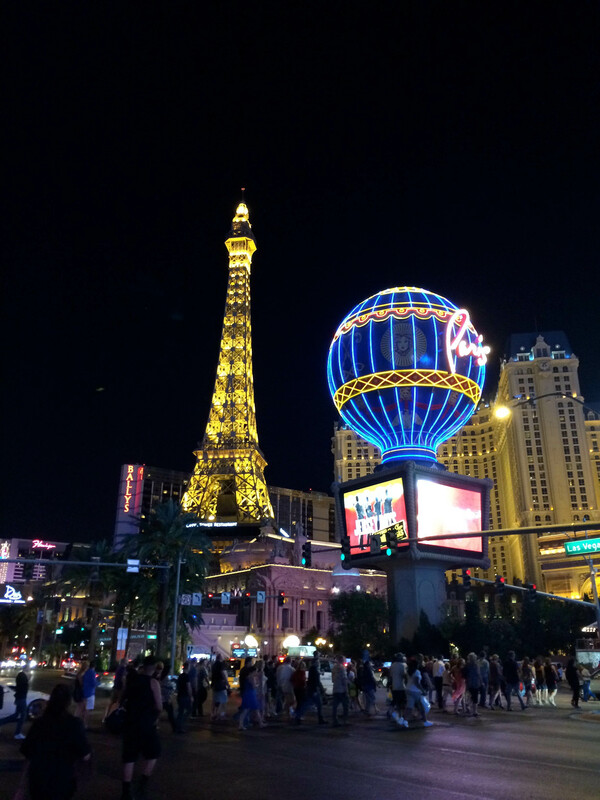 We walked over to Paris (which is right next to Bally’s) and the fancy Parisian outdoor cafe was packed! The line just to get to the hostess to get on a wait list was at least 20 people deep. We decided to keep walking. Next door was something called The Sugar Factory and they also had a huge outdoor patio. While we waited we sat at their bar and got some coffee and Bloody Mary’s. 😀 Their coffee was AMAZING!!! The best coffee I’ve ever had. We asked the bartender, waiter, waitress and no one seemed to know what brand of coffee they served. I was disappointed because I totally would have bought some if I knew what it was! 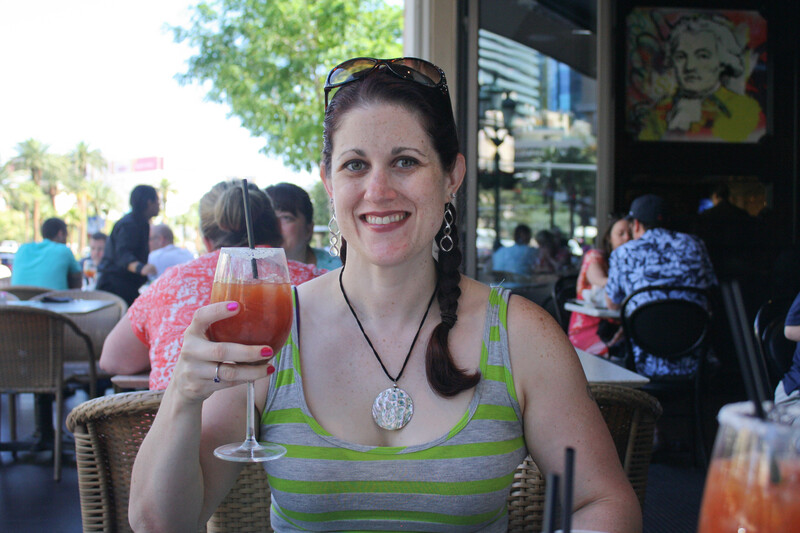 Their Bloody Mary’s were fantastically spicy. They used a spicy infused vodka in the bloody mix. 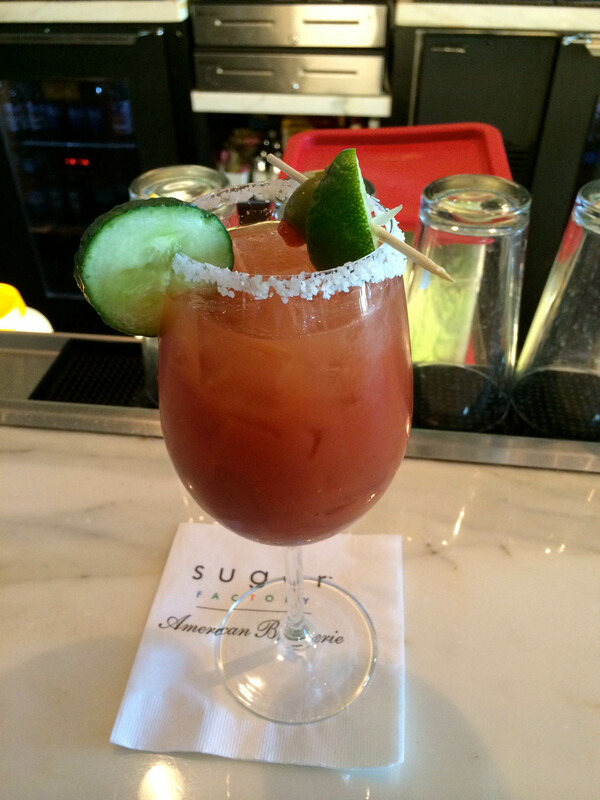 The salt was huge, flavorful crystals that clung to the glass, there was a hint of lime and cucumber in the drink and there was a cucumber and olive garnish. So tasty. It took about 20 minutes and then we got our table outside. There was a gorgeous breeze and it was about 70 degrees so far. 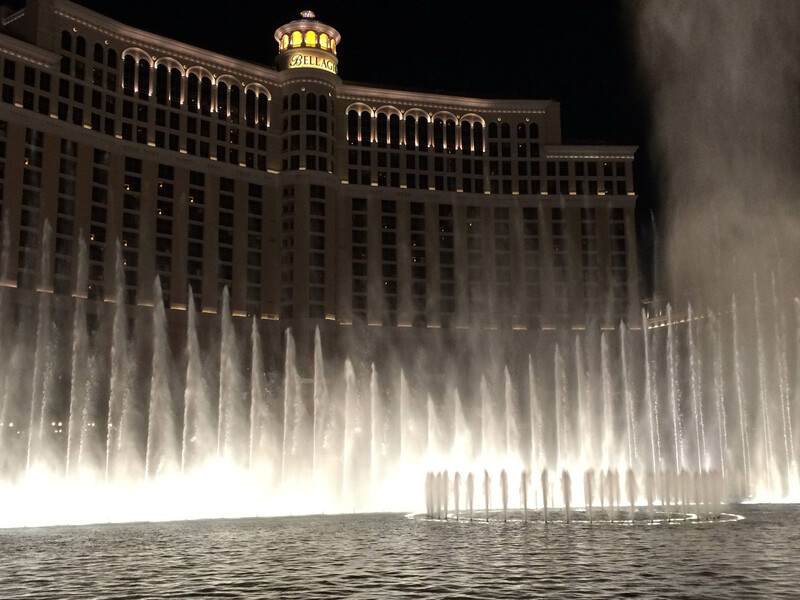 We were across the street from the Bellagio. It was a peaceful, relaxing time as we lounged on the patio. It was hard to decide what to get. I REALLY wanted the carrot cake pancakes but I knew the cream cheese frosting would just be too much sugar first thing in the morning. 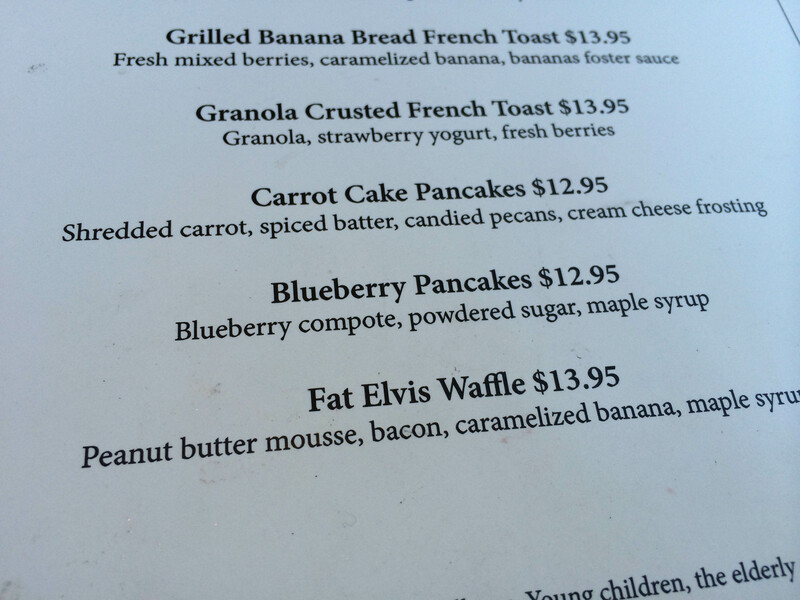 The blueberry pancakes sounded great and let’s be honest, so did the Fat Elvis Waffle (ok not really). I decided to go for the croissant sandwich. It was ham and cheese and came with crispy potatoes (that were exceptional). The sandwich was big and honestly half would have been the perfect portion. 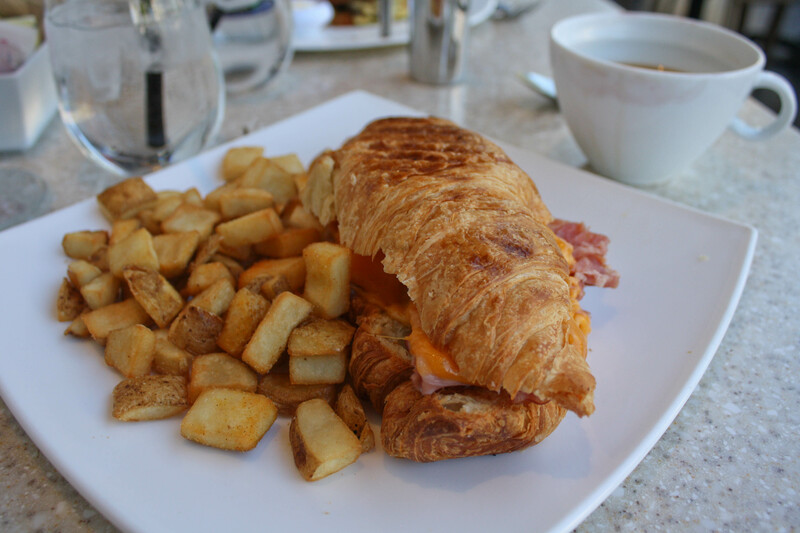 The croissant was heavenly–flaky, buttery and perfect. Dang, I want another! 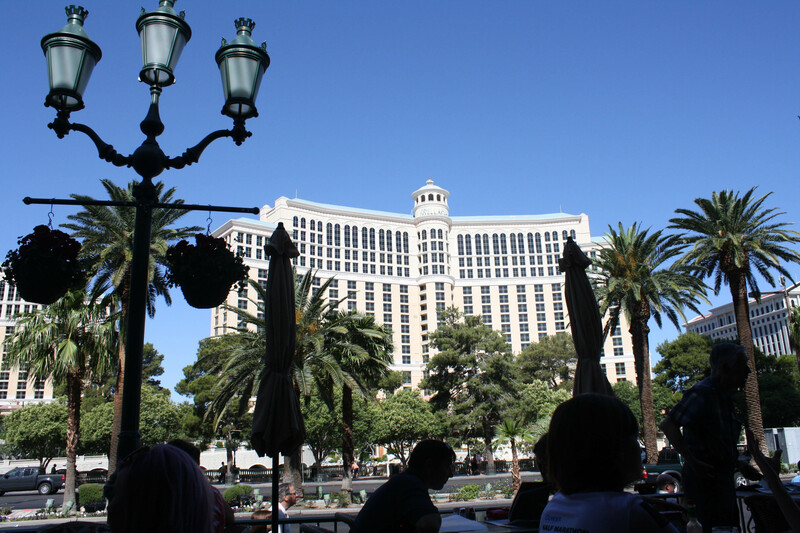 After breakfast we walked over to the Bellagio and caught the bus to Mandalay Bay. We walked around the gardens, checked out their AMAZING pool (it was packed!) that had a lazy floating river, and then went to see the Shark Aquarium (which was kind of expensive so we skipped it). 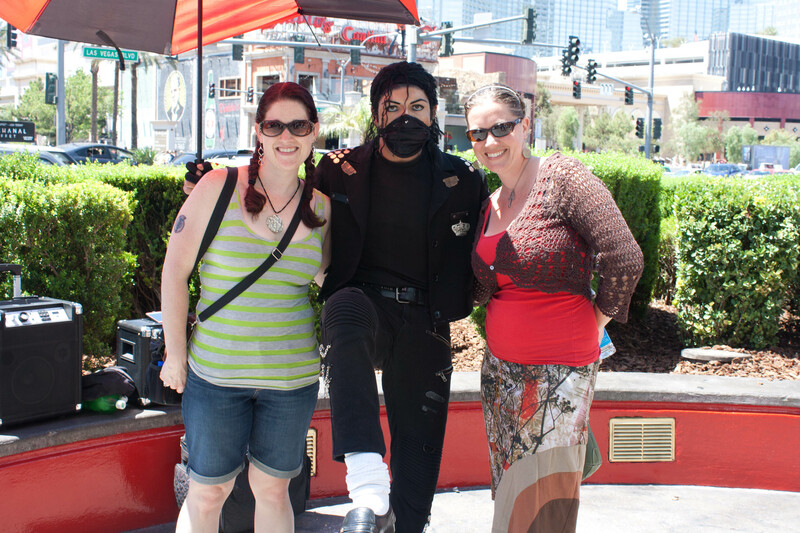 Then we saw MICHAEL JACKSON!! Woot!!! The street performer was great! He sounded, looked and danced just like the real thing. It was great getting a picture! We decided to hop on the bus back to Bally’s (our poor feet). Thankfully our bus pass was still valid! 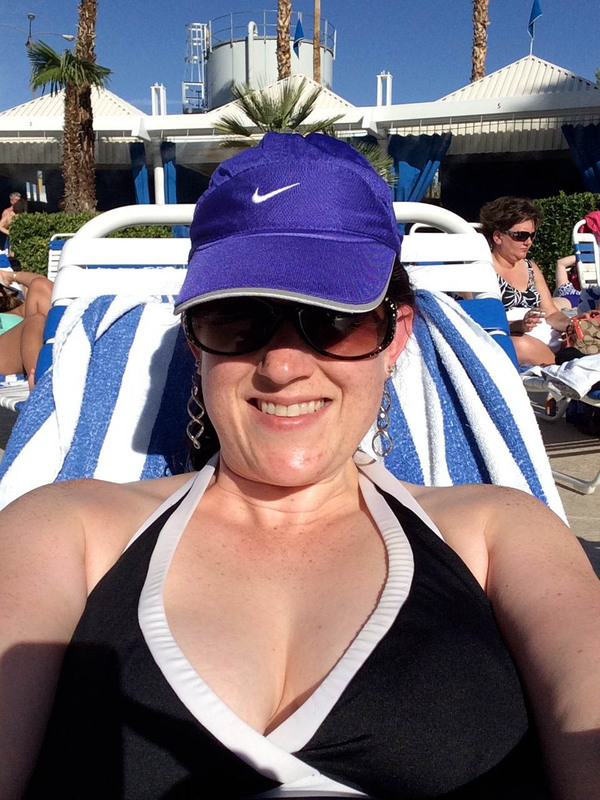 I have to admit, we stopped for more $2 tacos at Bally’s (they were that good) and then went down to the pool. We stayed out fairly long and the sun was hot hot hot! It was around 88 degrees on Saturday. It felt like heaven. For months I’ve been craving that exact thing–sitting poolside in the sun with a cool drink and a book. Hell ya we did Jello Shots! It’s been like 10 years since I had them. Haha! 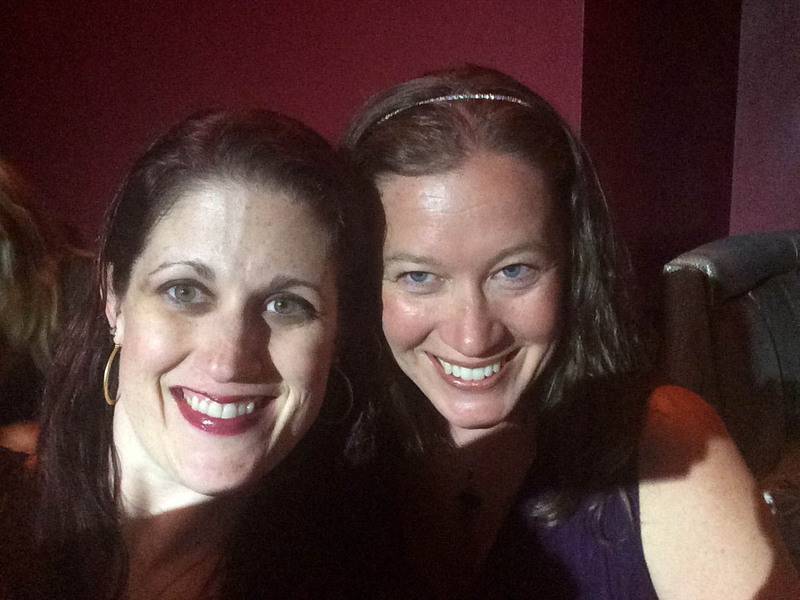 So the show…It was totally awesome. 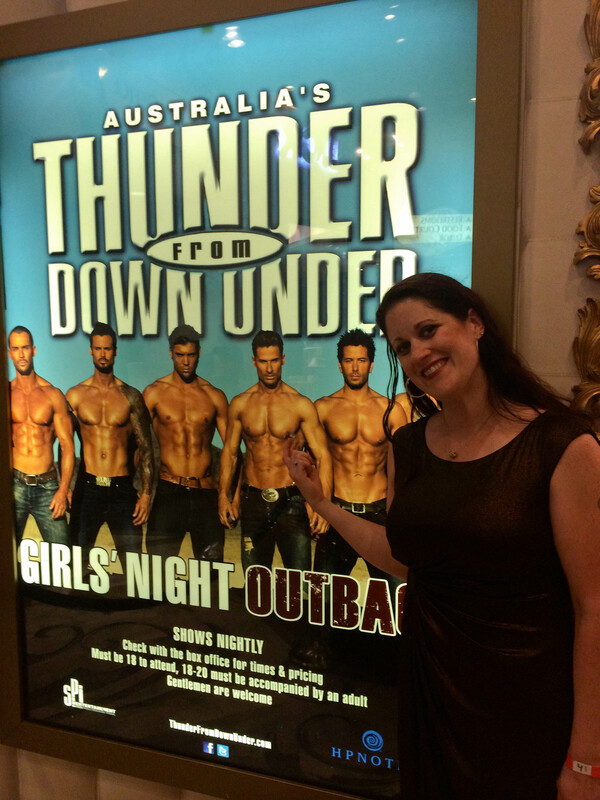 It was worth the money for the ticket and the guys definitely looked great–just like the photos. Afterward we could get pictures with the guys. 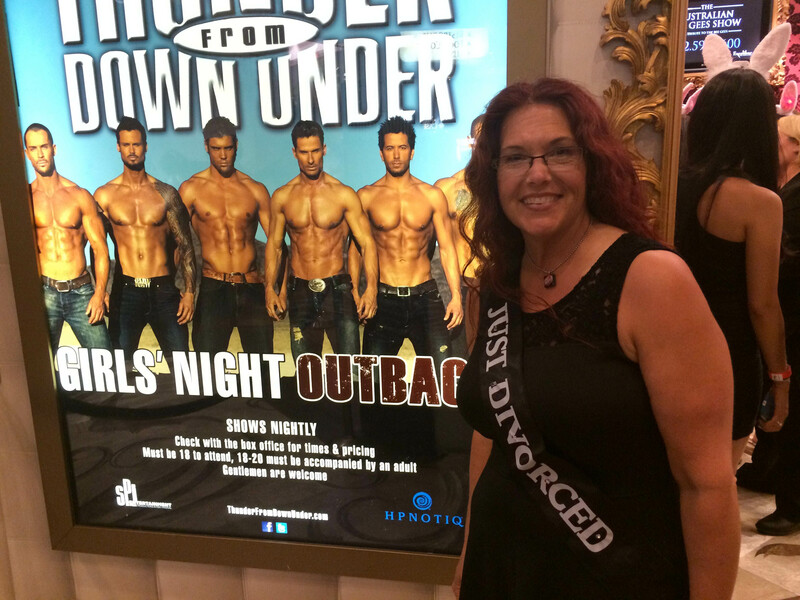 😀 We all got a free pass to a nightclub in the Luxor and free drinks til midnight but the line to get in was kind of long and I was starting to get tired (and blisters on my feet). Debby and her people ended up dancing til 2am! Anna and I walked back to our hotel, enjoying the nightly sights on the way. Why I decided to book us a flight so freaking early on Sunday morning is beyond me. UGH. Coffee was needed. 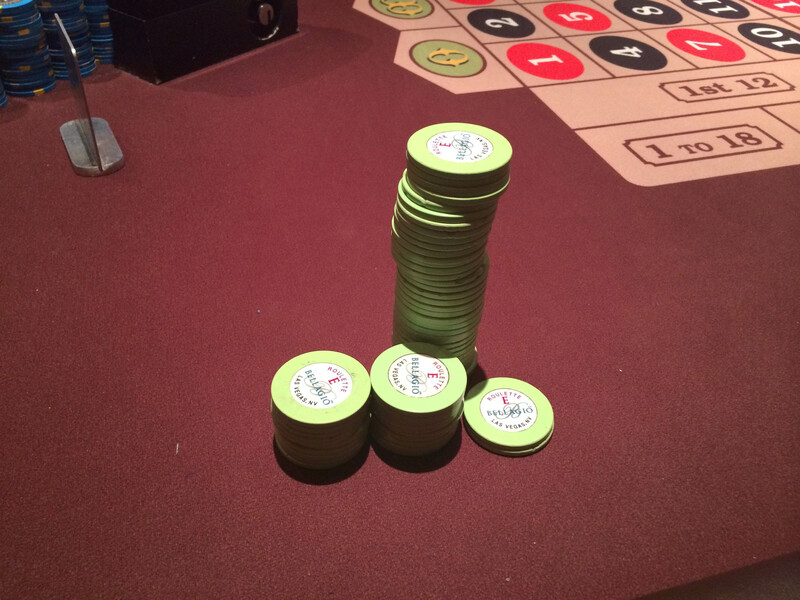 We had a few minutes to hit the tables before leaving and we both left winners! I got a hit on #29 and won $35 buckaroos. I was happy to leave after winning. 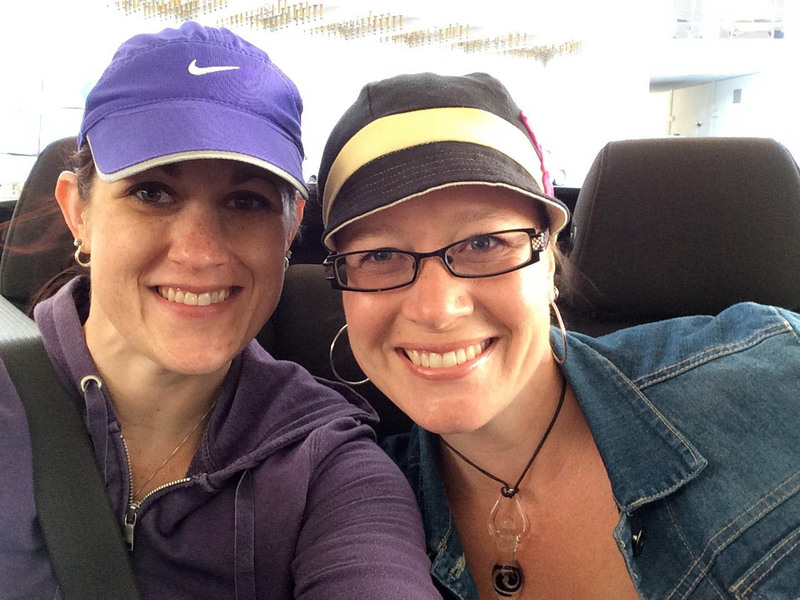 Debby had rented a car (a bright blue mustang convertible) and she kindly offered to take us to the airport. It was so AWESOME riding through Vegas in a convertible! One of the highlights for sure. Our flight was super turbulent — like the first hour of the flight I felt like I was going to barf and then die–and that sucked. The winds had started late Saturday night and Sunday was just as windy. I guess that was the cause of the turbulence. Dang it was not comfortable and I spent most of Sunday feeling nauseated. I was glad to be home and on LAND. Bella gave me lots of kisses, Fat Kitty gave me lots of love nibbles and it was so good to see Michael again.